Part of the wood sorrel (Oxalidaceae) family, starfruit, or carambola, grows in clusters on small, bushy trees. Typically 3 to 5 inches long, the fruit has thin, glossy skin that turns from green to golden-yellow to nearly orange when ripe. It’s found in tropical climates throughout Asia (where it originated), the Caribbean, Central and South America, Florida, and Hawaii. There are two types of starfruit, sweet and tart. Sweet varieties have thick, fleshy ribs; tart varieties have narrow ones. The difference in taste is negligible, though, since both types taste predominantly sweet when ripe. Starfruit is usually not labeled by variety, but the three most common ones found in the United States are Kary, which is sweet, and Star King and Golden Star, which are tart. This tropical fruit is crisp and juicy, with a flavor vaguely reminiscent of a grape or a pear: mildly sweet and floral. Try them in fruit salads for visual punch, or as a garnish to a cheese platter or dessert plate. The entire starfruit, except for its few small seeds, is edible. Starfruit make their way into grocery stores from late summer to late winter. A starfruit should feel heavy for its size and have smooth, shiny, evenly colored skin, with no signs of bruising. A ripe starfruit is extremely fragrant, and its skin is a glossy yellow or greenish yellow. Brown lines on the ridges are a sign of ripeness. Choose fruits that are firm, with no blemishes or bruises. You can ripen green starfruit by keeping it at room temperature and turning it often so the color will develop evenly. 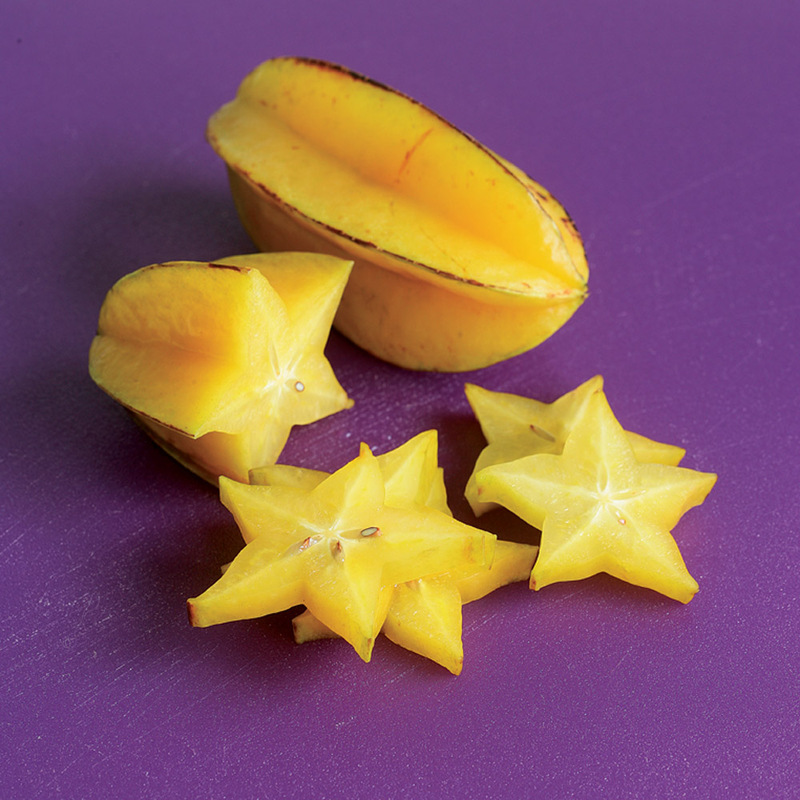 To use starfruit, trim both ends, slice it thinly to reveal its shape, and remove any seeds. 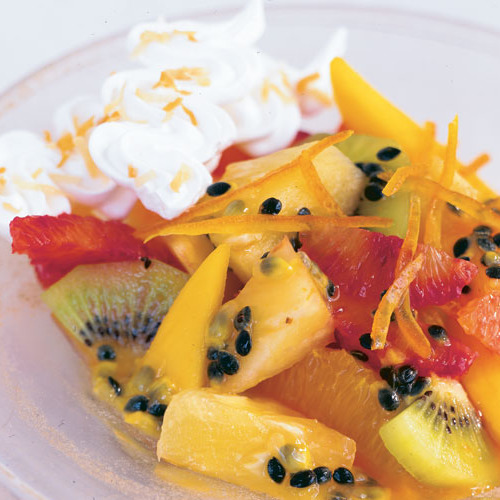 Add it raw to a tropical fruit salad, a pitcher of sangria, or a fruit tart. When cooked, starfruit stays slightly crisp. Toss it into a stir-fry; braise it in honey, cardamom, and chicken broth for a luscious side dish; or layer slices over seared chicken breasts and broil. 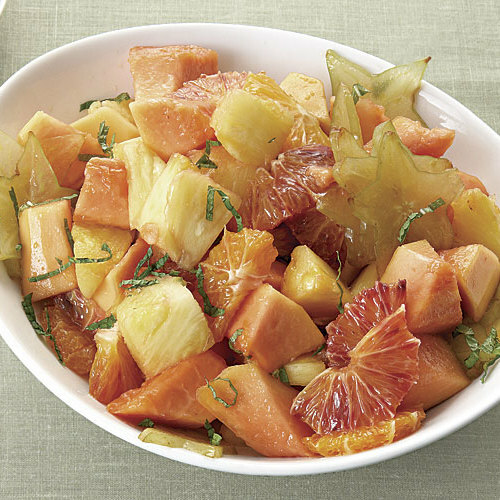 For a dessert, simmer sliced starfruit with cloves, cinnamon, honey, and a splash of rum to make a compote for waffles, or use instead of pineapple for an upside-down cake. With its citrusy aroma, starfruit pairs well with warming flavors like five-spice powder, cinnamon, and brown sugar. Savory but not overly rich ingredients like soy sauce, chiles, and wine are perfect complements, too. Store ripe starfruit at room temperature for up to three days or refrigerate in a paper or plastic bag for up to a week. Sliced starfruit freezes well for a few months. 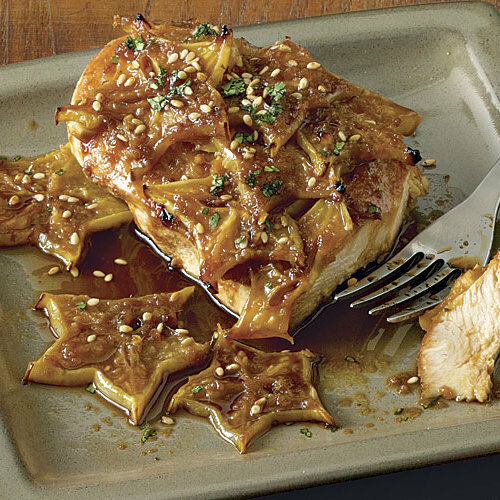 Topping seared chicken with thinly sliced starfruit shows off the fruit’s striking shape and adds some crisp texture to the dish.